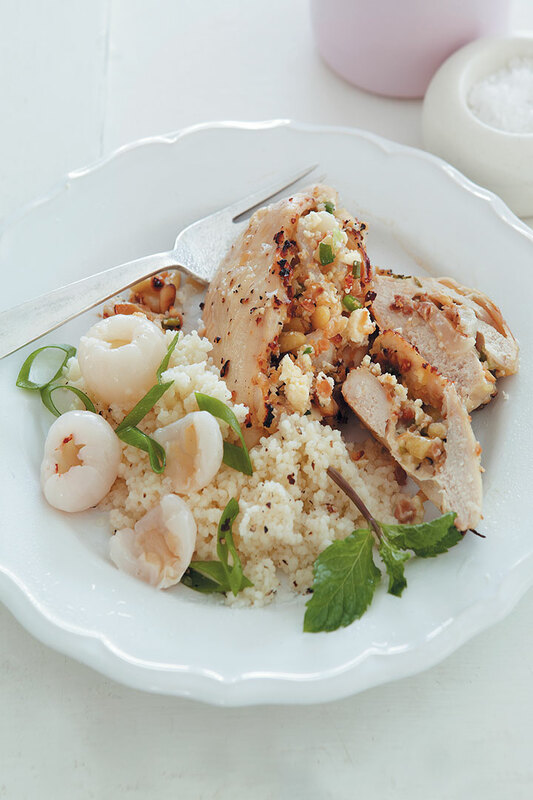 Litchi, pine nut and feta stuffed chicken breast with spring onion couscous is a great way to add something special to a conventional chicken dish. The sweet juiciness of the litchis is delicious with creamy, salty feta, and the meat is cooked until succulent and tender. Perfect for a filling lunch. For the chicken, cut a slit on the side of each breast to form a pocket. Season the inside of the pocket. Mix the rest of the ingredients well together. Stuff each chicken breast with the mixture and gently fry on both sides until golden, but not fully cooked. Place the chicken in the oven and bake until it is fully cooked through, about 5 minutes. For the couscous, place the couscous in a mixing bowl and add boiling water until it is just covered. Cover with cling wrap and let it sit for 10 minutes. Season and mix in the spring onion. To drink: Avontuur Estate Luna de Miel Chardonnay Reserve 2009.